Video games and YouTube only takes one so far into learning the tricks of rally driving. Autopia's Jason Paur went to rally school for a real education. — Ed. SEATTLE - The sound of stones pummeling the bottom of a rally car is a lot louder when you're in the driver's seat than it is when you're watching a race on TV. I'm in a rally-prepped Subaru WRX STi with my instructor, Forest Duplessis. He's encouraging me to do a better job coordinating my braking and steering so I can get the car to veer right to turn left. We're driving next to a giant abandoned lumber mill, and it's easy to discern the difference between the big stones and the little stones as they pummel the car. It's much harder to get the timing right of this particular maneuver, called the Scandinavian flick. 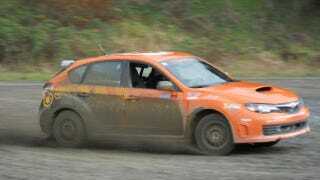 The flick is a lot of fun to learn, which is one reason I'm at DirtFish Rally School outside of Seattle. The school is less than a year old and the only place in the country where an average Joe can strap into a 300-horsepower, all-wheel-drive rally car and discover all the technology in the world can't keep you from screwing up a Scandinavian flick if you don't properly set up the turn. Today marks the beginning of the 2011 World Rally Championship season with the inaugural race in Sweden. It's a new era for the WRC, with all-new cars and tech powering the drivers. There are new rules, new cars and new teams, and it's drawing record interest in the sport. The new rules have drawn a lot of attention from rally faithful, but the skills required to drive the cars haven't changed. And that's why we're at driving school. DirtFish was started by a pair of rally enthusiasts who wanted to create a driving school unlike any other in the country. Greg Lund rallied in the 1980s and has been involved in the sport since. After many years spent competing and working behind the scenes, Lund had a vision for creating a playground of sorts where drivers could safely learn the skills to drive a rally car. "Our courses are a way in," Lund says. "The three-day course allows you to get points towards your rally license." DirtFish isn't the only rally school in the country, but it is the only one to providea chance to experience the power and technology of a modern rally car. And it's also the only place offering what rally driverTravis Pastrana called "a big skateboard park for adults." The school operates on a former lumber mill about half an hour east of Seattle. It sits on 315 acres that include a mix of mostly gravel surfaces with a few paved areas. In addition to some open spaces where you can learn the basics like left foot braking and car balance, there are several miles gravel roads, hills and the ability to experience just about every rally driving experience. You aren't driving entry-level or anemic cars, either. Students learn to slide sideways in fully equipped rally cars built by Vermont Sports Car, home of the Subaru Rally Team USA. Four cars are 2009 WRX Sti models with stock 305-horsepower engines. They have been modified with roll cages, rally suspension and brakes. For the more advanced lessons, the school also has four 2007 Subarus that have been built from the ground up to the Group N specifications that are used worldwide for the production based raced rally cars (PWRC). These were stripped to the bare body and reinforced to increase the stiffness. Then they got a roll cage, rally-spec engine, clutchless gearbox, hydraulic handbrake and the beefy brakes and suspension needed to race on the toughest rally stages. "You have a fire breathing Group N car," Lund says of the vehicles. "You're not driving an 80-horsepower front wheel drive car here." My instructor is 25-year-old Forest Duplessis. He grew up around the sport in Maine. He started driving rally cars when he was 13 and enjoyed a stint as a race driver before moving west to work full time as an instructor. His brother is among the country's top drivers and teaches on the east coast. As for me, I'm still having issues nailing the timing of my Scandinavian flick. It's something I've studied watching plenty of videos, but as is so often the case with everything, it's much harder to do in real life. Duplessis suggests being a bit more patient with the pendulum to the left. "Let the rear end come around a bit further before making the turn in the other direction," he says over the drone of rock pelting the underside of the car as we're sliding sideways past the corner again. "And use the weight transfer to correct for the understeer." Patience does the trick. After a few successful turns with the car drifting to the right and then making a hard turn to the left, I feel I've accomplished something. Then Duplessis tells me the technique really isn't used much anymore. He moves onto the the more modern trail braking turning technique drivers use. Duplessis demonstrates. It's readily apparent that, with modern all-wheel drive differentials, trail braking is the faster way to take a corner. So I'm back to square one, learning a new technique. On my first try I'm late letting off the brake with the left foot. I slide well past the corner, again. Turns out no amount of advanced technology can make me look like Juha Kankkunen. At least not yet. This story originally appeared on Wired.com's Autopia on Feb. 10, 2011, and was republished with permission.